Never underestimate the influence that a healthy and happy mother has on a healthy and developed newborn. 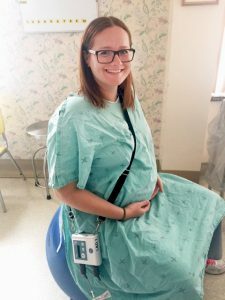 Even though having a baby is one of the most significant moments in her life, labour can be a stressful, lengthy and painful experience for some moms. The Maternal Care Unit in Saskatoon is now able to minimize these burdens for the approximate 16,000 mothers who deliver babies in Saskatchewan by operating two new Avalon CL Fetal Telemetry Units funded by the Jim Pattison Children’s Hospital Foundation grants program. The units, now in full-swing operation for moms-to-be in Saskatchewan, allows for more birthing options resulting in an overall more pleasant arrival of her baby. These portable and waterproof devices facilitate labour where mom has freedom of movement when continuous fetal monitoring is required. Mobility and flexibility during every stage of labour is now an option for mothers, as well as the option to labour in the shower or tub which some mothers find soothing. Before baby is even born, mom will experience a more comfortable labour. Allowing mom to have the choice between a shower, bath or simply a walk down the hallway has shown to improve labour management and further the labour process. With the device giving moms the chance to be more active in labour, there is potential for the labour to be shorter. Labour is a personal experience for a woman and having the ability to move more freely while knowing her baby is monitored provide more options and help women achieve their birth plans. In addition, the device integrates Smart Pulse technology which helps medical staff to distinguish between maternal and fetal heart rates. This way, a more immediate response to heartbeat irregularities, whether it is mom’s or baby’s, means that medical staff can make more informed clinical decisions.